A 2-player battle game made for Ludum Dare 28 (December 2013), for the theme you only get one. The game goes like this, two players, each has many fake mine and one possibly real mine, but you never know if you get the real real mine until the detonation of the possibly real mine. It can be played with keyboard or Xbox 360 controllers and it has sound. You lay as many mines as you like, and hope your opponent will come close near the possibly real mine and you detonate the mines. If its real, you win. If its not, you can still play cool since your opponent has not yet deploy the real mine and still doesnt know that is a real deal. If your opponent detonates the real mine and doesnt blow you up, then you are the winner. boom was created on 2013-12-13 by Joseph Lansdowne, written in Python 2/3 and C with Pygame under the GPLv3, currently git-a0fb8ac (2014-01-18). Unintentional Christmas Tree is a fun and small arcade action puzzle game. You just lay the same color blocks on top of each other. It has two modes, easy and hard. In hard mode, you cant make any mistakes, e.g. red on green, or that would be game over. In easy mode, lets just say that you can break this tree really easily. Unintentional Christmas Tree was created by Joseph Lansdowne on 2012-02-27, written in Python 2 with Pygame under New BSD License (3-clause), currently git-da562ee (2012-02-27). The question is not red or green but left or right. Dr. Mario or BUGS is a clone of Nentendos Dr. Mario, well sort of. You fix bugs instead of eradicating deadly viruses. From red, yellow, and blue viruses to A, L, and S bugs, but you are still a Dr., just not a physician one. The controls are hjkl to use in options to change level and speed, or in game for moving the piece around. as to rotate the piece. p to pause or resume the game. This clone was made in 1991 by SRN, according to the comment, released under the name BUGS or BUGS I as version 1.3, then in 1992, Scott Noecker and Ken Corey released under Dr. Mario and for Linux. Dr. Mario was born on 1991-07-10 and has been placed in public domain, is written in K&R C, currently hg-0541a33a647e (2015-11-14, post 1992-06-15). Legend of the Seeker [IMDb, Wikipedia] is a TV series based on The Sword of Truth, a novel series. I never watched a show about epic world, full of magical power, warriors, wizards, strange creatures, and others we have seen in movies. I wonder if this show has something from The Lord of the Rings in spirit of art or visual effects. It's shot in New Zealand, a beautiful country. There are many stunning scenes in the show. Bullet Time is used many times. However, it's not so magical, most time I saw is the fire spell. I was expecting more than that. But fighting scenes are good. Are all Confessors good at fighting? Anyway, when Kahlan confesses a person, the pupils become full black, then the whole eye. I believe that I saw X-Files' shadows. Wait, that's black floating stuff. That should be Supernatural's shadows. It doesn't have much can make you LOL, but it's not boring at all. Maybe this is because it's new type of show for me. Get Smart is not like Austin Powers, although there are some moments quite same playing like an idiot. Agent 86 does have something. The only (maybe not) twist is easy to expect and to guess whom is the double agent. It's hilarious, of course. Ann Hathaway is another plus for this film, I don't mean her acting. Honestly, I don't have much to say about this kind of film. Just have fun to see it. Has anyone tried the stapler? That must be very hurt. I didn't think Wanted is a film I would like. After saw it, I think it's quite interesting and so is its title. Beside the action parts, it seems to knock you up for your life. Getting you to ponder how you live. Of course not to compare with the exciting life in this film. But remind you what you are doing or what have you been up to lately. Wesley Gibson has a 9-to-5 boring job. Suddenly, the whole world changes in a night. Well, we don't need that such big change and that probably is just a daydream, but we can try to make few small changes to live our life vividly. Once in a while, I would go into depression and cut some connections off. Then, I get boosted up. I must say that is not right to live but I can see at least. Every time I back, I usually would do something different. That is like small experiment to find out a better way to handle my life. Someday, I can really live. This film wasn't named "Assassination" or something like that but "Wanted." That doesn't feel like FBI Wanted list when you see this film. It's more suitable to explain it as "wanted life" or "wanted things." He wanted to be an assassin and he did do it. Thinking is not enough, you also need doing. PS. the ending is out of my imagination, I can guess the result but didn't think Fox would do in that way. Every time a film has religion as part of elements, I can not write much about it since I don't know much. 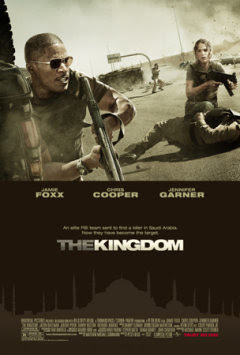 The most interesting thing is not about this film, even it has good action scenes. When I read the cast list, Ashraf Barhorn (played Colonel Faris Al Ghazi) got my attention. The biography writes "He is Israeli, of Arabic heritage." Before this, I thought Israel is 100% Jewish citizens. I was wrong. "Arab citizens of Israel" explains 19.7% citizens of Israel are Arabs. I know there are Arabs live in Israel, but I never thought they have citizenship. Maybe they do not think they are citizens of Israel? Ronald Fleury: I told her we were gonna kill 'em all. 15-Year-Old Grandson: Don't fear them, my child. We are going to kill them all. I believe that is to point out whoever you are, most of use are not saint. Only few people can convert angry into forgiveness and even help the enemies. Many cultures or religions teach their people not to use violence or to revenge by indignation, I wonder how many of use can follow when things happen on us?